Do you see it out there? Beckoning you on the horizon? The giant ‘X’ marks the spot: the actual achieving of that elusive goal. But how do you get there? Does this sound a little too familiar? When you were younger, you sprinted straight toward your New Years’ Resolutions with enthusiasm. But, tired and out of breath, you wore yourself out by February 7th. Womp womp. When last year rolled around, you had great intentions! But—surprise!—you had a baby. So that took you down an entirely different path. Girl, if this is you: I get it. What helps me conquer my New Year’s Resolutions (which became even harder with mommyhood) is to start by backing up and taking a long, hard look at my destination. Then I map my route. Using this map, I’ve achieved many goals! It may seem simple, but using a map is the single biggest difference between arriving at your Hopes and Dreams, and wandering aimlessly in the Forest of Frustration. Break out your No. 2 pencil. It’s time to start your first cartography lesson! Several years ago, a mentor brilliantly suggested this rule that completely changed the way I make goals: base your goals on your roles in life. As you consider what goal(s) to work toward this year, use your list to help you prioritize what’s most important. It’s good to have ambitions in all of the areas of your life! But having your roles prioritized will help guide you in both making the goals and deciding what to keep when push comes to shove. One of my goals for 2015 was to begin selling stock photography. But, when I need to decide between working on that project or caring for my toddler… Well. The toddler wins! By basing goals on your roles, this does not mean it is bad to have goals that are yours! So you want to lose 15 pounds. Or write a novel. Or just take a shower in peace each day. Great! The key here is balance. Consider what is the right balance for you and your family. Taking care of your own health will likely make you a better wife and mother. And writing that novel? If having that outlet will benefit you, it could benefit your family to have a happy mama, but if you know that would mean more Daniel Tiger television time and boxed mac-and-cheese for every dinner in 2016, maybe save it for a season later in life. Interstate or scenic route? Whichever you prefer! There is no rule that says all New Years’ Resolutions must be drudgery. Make sure to include some things you love on your list and include action steps! One of my 2015 goals was to visit grandma and grandpa in Arizona. Man, life is rough. Thinking about getting to know the new neighbors? Invite them over for tea at least 3 times in 2016. Love to knit? Do a certain number of knitting projects or try a new challenging pattern. Want to freshen up your home? Redecorate your living room or bedroom this year. Fill your resolutions with more than just WORK and EFFORT. Toss in a few that you can look forward to checking off! As you would on a road trip, always have your map with you and check it often to be sure you’re on the right path. Have support! I send my list of goals to some close friends and family each year so they can hold me accountable. Use the buddy system. If you have a friend with similar goals, work toward them together. Make a checklist so you can track your progress. Use a family organizer, Google calendar… whatever works! Give yourself automated reminders. Isn’t technology grand? Don’t try to get it all done in January. Pace yourself. This is a marathon, not a sprint. As Dr. Leo Marvin so expertly taught us in What About Bob?, use baby steps. Create specific, measurable goals and review them often (because you wrote them down, right? See Step 3). Then track your progress. GOAL: Become a better wife. Say something encouraging each day when he walks through the door. Play basketball/video games/board games (whatever he loves most) with him at least 10 times this year. Buy and read For Women Only. GOAL: Get healthy & lose 15 pounds. Download and use MyFitnessPal app to track daily calories. Make sure to stay under the recommended calorie count. Take at least 10,000 steps each day. Revise one major sugar-source per month to no-added-sweeteners version (bread, cereal, sauces, etc.). 100 minutes cardio, 50 minutes toning exercise per week. GOAL: Become a better mom. Save all my screen time for when baby is sleeping. Read Making Children Mind Without Losing Yours. Get up a little earlier (or stay up a little later) to squeeze in some silence. Grab a copy of The Toddler’s Busy Book and do one or two games throughout the week. Plan one playdate or trip to the library/museum each week. There’s a VERY good chance you are already a wonderful mom. (Otherwise, why would you even care to become a better one?) Sometimes we just need a little boost that we aren’t as crappy as we feel. 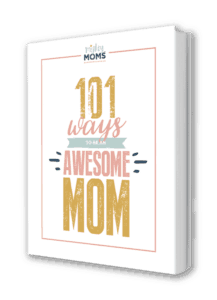 🙂 Read through 101 Ways to Be an Awesome Mom if you need a little pep-talk! Create a portfolio website by June 1. Create a Facebook page for the business by July 1. Hopefully these examples give you some ideas for how to make your goals attainable by breaking them into steps. Do whatever you can to get any hindrances out of the way of your path to reaching your goals. Limit time-wasters. I cringe at the thought of how much of my social media time could have been better spent. Put things in place to help yourself. For example, keep your running shoes at the office so you remember to go to the gym over lunch. Treat yourself to things that will help you reach your goals if you have the budget for it. Buy an app that will help you reach your goal! Get a Fitbit and some cute new running shoes to help you shed that baby weight. Get that bread maker or an epically awesome blender that will help you make healthier meals. Make it automatic. Trying to save money? Set up the account for an automatic monthly transfer to your savings account. Where possible, use automated technology to help. Step 6. Arrive at Your Destination… or Don’t! If you reach your goals at the end of the year, great! But flexibility is key. Life happens; things change. Be patient with yourself and your circumstances. In 2009, it was one of my goals grow in my career. When I was laid off due to budget cuts, my goal became: Find a new job. And that’s OK.
For 2015, I aimed to lose that last 12 pounds of baby weight…but then I became pregnant with baby #2. And that’s OK! Don’t beat yourself up if you change—or just don’t reach—your goals. Maybe you didn’t read all 10 books on your list. But you got through 5 of them—a step in the right direction! Better to read 5 out of 10 books with purpose than 5—or 10—random books for no reason. Do your best, give yourself grace, and you’ll be surprised how much you can accomplish—whether everything on your original list gets done or not. Such a great post! Thanks for the encouragement! We are planning a huge move and continued homeschooling for the next couple months….all I can think of is survival…! But this is a great and inspiring way to think about this next year’s goals. Thanks so much! I’m so glad the post was helpful, Denielle. Sounds like you’ve got your work cut out for you! One day at a time, and you’ll do great. Thank you Christi, really appreciate your work. Your words have really come come at the right time. Firstly this year I want to loose weight and concentrate on my studies. My mind has been set for much bigger things In my life. Thank you ?. It’s amazing how much stress we can relieve by just breaking things down into smaller parts. I usually don’t do resolutions, because the whole idea overwhelms me, but after reading this I’m excited to break out a pad of paper and start writing a few things down. Thanks for the inspiration! Isn’t “What About Bob?” just the best?! And I hear ya! Breaking things down into smaller parts is the ONLY way I get goals accomplished. Glad the post was helpful.